The Egbe Omo Oduduwa [The Society of the Descendants of Oduduwa] was Yoruba premier cultural organisation founded by Chief Obafemi Awolowo and a group of Yoruba students in London in 1945. It was rejuvenated in Lagos in December 1947 and was formally inaugurated in Ile-Ife in June 1948. 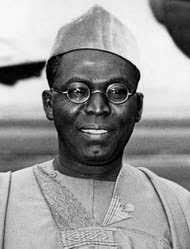 Its first president was the late Adeyemo Alakija while Obafemi Awolowo was elected as the first General Secretary. The main objectives of the Egbe were the organisation of a virile, efficient and modernized Yoruba state within a Federal state of Nigeria, the protection and development of Yoruba culture and traditional institutions, and the protection of the interest of the Yoruba so that future generations of the Yoruba would have a secured place in Nigeria. Between 1948 and 1951, the Egbe awarded scholarship to 21 students from various Yoruba towns. The Egbe was banned by the Federal Military Government in 1966, along with similar ethnic group associations. Emi, …………………………………………………………………………………..se ileri tokantokan niwaju Olorun ati eniyan, lati duro dede ninu Egbe Omo Oduduwa ati lati faramo gbogbo ofin ati eto Egbe yi. Ki Olorun ki o ran mi lowo ninu ileri yi ati ninu ise rere mi gbogbo si Egbe Omo Oduduwa. Ase!!! I,………………………………………………………………………….faithfully promise before the Almighty God and in the presence of my fellow compatriots, that I shall ever remain loyal and firm in the Egbe Omo Oduduwa and I shall ever obey and support the constitution of the organisation. So help me, Oh God, in this my oath and in my obligations to this Egbe Omo Oduduwa. Amen!!! I wonder if the breed of politicians today can make such an oath. I doubt If we can find 1% . One of Justice Kayode Es̩o̩’s most significant judgements concerned the attempted deportation of the Speaker of a Northern State House of Assembly, Alhaji Abdurrahman Shugaba Darman . Please, O Golden-penned One, if you have not already done so, kindly unsheath your literary sword and dissect the matter for us lesser mortals, that we may relive one of the landmark cases in Nigeria’s legal history.